Enhanced Abilities: The Titanium Man’s strength, endurance and agility are all enhance by his armour. Body Armour: The Titanium Man’s armour provides him with a degree of protection from physical and energy attacks. The armour also provides resistance to heat, cold and radiation. Flight: The Titanium Man has jet engines in his boots that allow him to fly. 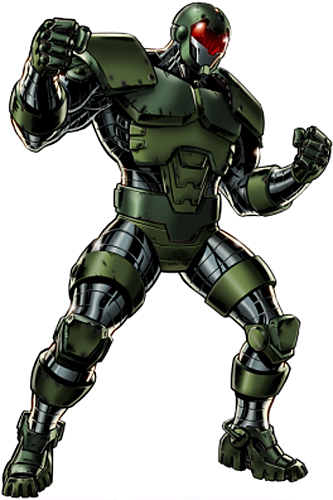 Weapon Systems: The Titanium Man’s armour is equipped with gauntlet blasters, helmet mounted heat beams, gauntlet mounted tractor beams and radar rings of coiled metal capable of grappling opponents. Cloaking Device: The Titanium Man features a cloaking device that creates an illusion of invisibility over the suit and its wearer. The cloaking screen also functions as ECM (electronic counter-measures) against radar devices and early-warning systems. Boris Bullski was a high-level Communist Party official in the Soviet government. His unbridled ambition within the Party, as well as his intimidating appearance (which won him the nickname of "Boris the Merciless") garnered the disfavour of Kremlin officials, who transferred him to an administrative post at an obscure work camp in Siberia. Angered by the demotion, Bullski had the scientists create a suit of titanium armour containing highly sophisticated weaponry. The scientists were unable to duplicate Iron Man's armour, so their product was nearly twice the size and weight of Iron Man's suit, part of the volume being filled by Bullski's large frame. Bullski planned to use the armoured suit to battle and defeat the American hero Iron Man.